Move beyond prioritization spreadsheets and gut decisions. 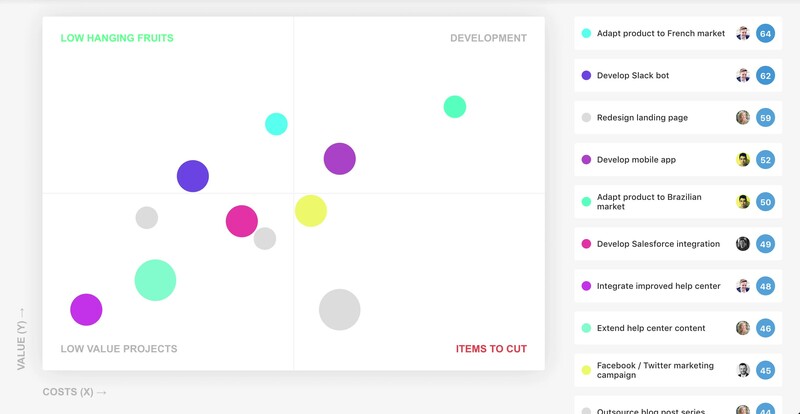 Score all of your projects and features to identify what to focus on next. "airfocus is a no-brainer for every serious decision-maker. Making the right decisions based on strategic influences that actually matter has never been more straight forward." 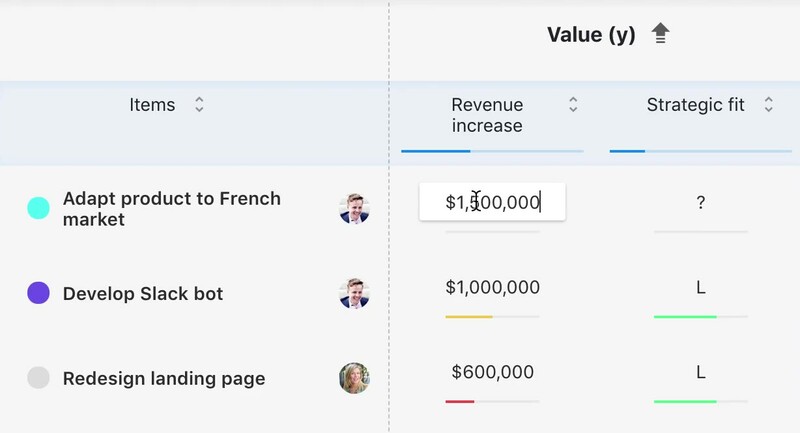 Our algorithms calculate your priorities and visually map them out on a chart so you can make informed and more objective decisions. "We love the visualizations of our projects and priorities on the value vs. cost chart. It really helps making these difficult roadmap decisions." Drag'n drop presentation-ready roadmaps that are based on objective priorities. Lay out your strategic vision and take the lead on the path to achieve your goals. "We use airfocus in our roadmap meetings. Over and over again, it has made us rethink our priorities and come up with a more solid roadmap." Invite experts to your prioritization system to benefit from team wisdom. 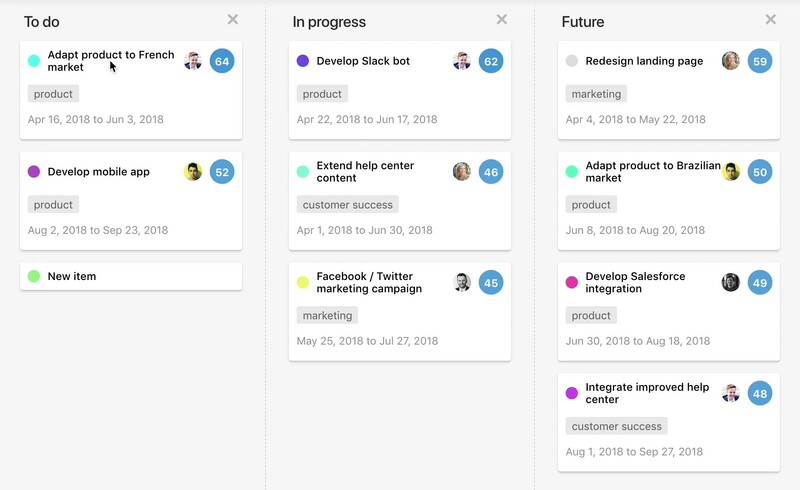 Easily share kanban or gantt roadmaps to build consensus across your organization. "Our sales management team uses airfocus to identify key areas of focus for each quarter. Now everyone knows what is important. 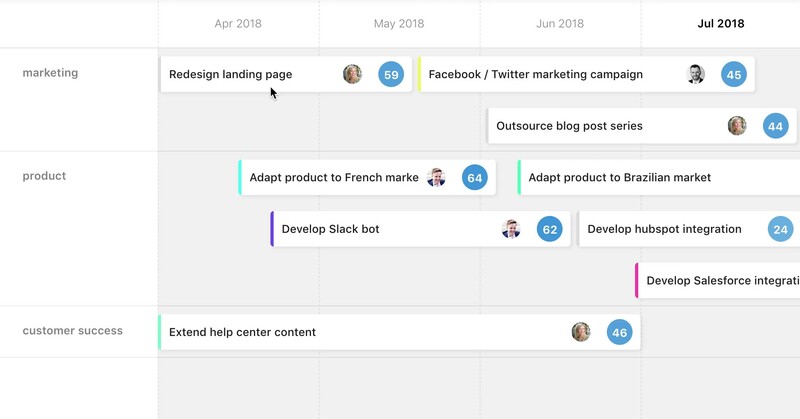 I love the roadmap links that I can then send to my team." Easily set up your first workspace in minutes by completing the wizard or pick from our ready-to-use prioritization templates built on the most effective decision-making methods. "I had limited knowledge about how to prioritize. I completed the wizard by answering some easy questions and had my first scoring-workspace set up in less than 10 minutes. Just great." Use our Jira, Trello or Asana integrations to get you started in minutes and have your content synced across all your tools. "We love how seamlessly it integrates with Jira and Trello. We use both: Jira for development, Trello for anything else. airfocus is now the hub for all things strategy." The airfocus mobile apps are a perfect extension to your airfocus web app. Get a bird's eye view on what is important right now, and what is not. Learn how airfocus helps decision makers and teams focus on the right stuff. Product teams use airfocus to give stakeholders a say in what to build next and help prioritize features. The app complements existing scrum or kanban processes and gives everyone clarity on product strategy and roadmap. Project managers across industries use airfocus to make decisions build roadmaps based on data. Beautiful, auto-generated exports help their teams work towards shared goals. Prioritizing the most promising initiatives to grow and retain customers is key. airfocus empowers sales and marketing managers to align their goals and roadmaps with other departments to work more collaboratively. "Companies that actively prioritize are worth 40 % more than their peers."(McKinsey). Chief executives and managing directors use airfocus to make and communicate consistent prioritization decisions and get everyone aligned. "airfocus helps us make superior decisions and get the right stuff done. No more outdated spreadsheets and unclear roadmaps." For teams that want to collaborate on prioritization and roadmapping. Have questions or are interested in an enterprise solution? Please contact us. airfocus collects sales taxes in states where it is required by law. Stated prices do not include these taxes.